We hear it from all over - Thank you(s) from folks who long for the country. 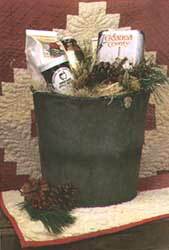 These all time pleasers make great waste baskets, planters or catchalls. "I saw one of these hanging on one of those maple trees!" Yes and it can be yours, overflowing with maple goodness. Two 1-lb stoneground mixes; 1-Qt of Pure Maple Syrup; two 1/2 pints of Amish Jams and Apple Butter; and 1-lb of Pure Honey. P.S. Our Maple Master only recycles the gently worn buckets so no promises that they won't leak!